In discussions about colour there are always comments regarding the appearance and matching of artifacts to standard swatches. Unfortunately, all too often the matches are being made visually, and therefore subjectively, rather than by measuring the original colour and using software to identify the closest matches with qualifying difference measurements. Once matched the communication of the identified colours is dependent upon having the cross-referenced standard in order to "see" the colour referred to. In the case of on screen swatches the viewer is dependent upon the colour calibration of the monitor and also the software being used to view the swatch. The integrity of the swatch is also highly dependent upon the software that was used to create it. Another important and often overlooked factor is the illuminant used when calculating and rendering the colours. Very often those conducting the preliminary visual matches between artifacts and standard swatches are using direct sunlight to do so. In the communication of colour through internationally acceptable standards that particular illuminant is effectively obsolete. Direct sunlight (as opposed to daylight) may tend to introduce a very slight muddying (browning) of the colour and to reduce the visibility of any green chroma to the observer. Illuminants cannot be dissociated from the XYZ data they helped to generate. When providing colorimetric data, information on the illuminant used for the measurements always has to be given in order to understand and further process the data. Various standard illuminants have been devised to satisfy the evolving needs. Naturally a colour swatch viewed under direct sunlight at noon will appear differently to a measured value from the same colour rendered with an illuminant of D65. Please spare a thought for the influence of illuminants when hotly debating the colour in that colour photograph or swatch! 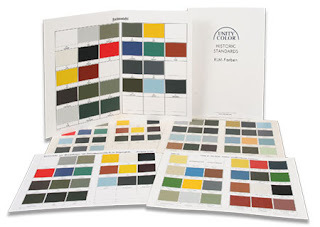 Having recently obtained two mainstream and supposedly ground-breaking books on the subject of colour schemes and markings it was very disappointing to find that both authors had made no attempt whatsoever to communicate the colours they were discussing by cross-referencing to established colour identification standards. Both relied on descriptions of the colours and printed profile paintings to convey the information. Far from satisfactory in an age when more rather than less precision is expected on the subject! Some conceal a lack of rigour in their work by scorning attempts to be precise about colour as pedantry - or punditry - and plead the "anything went" view of historical military colours. These approaches usually wax lyrical about hard-pressed groundcrew "in the field" making do and crew chiefs ignoring the niceties of official instructions. Whilst undoubtedly true in some circumstances, this is a simplification and does not lend itself to the complexities of reality. Unfortunately, in the study of aviation colours subjectivity, an emotional adherence to established conventions and a desire to make the evidence conform to a preferred hypothesis seem to take precedence over a more scientific, detached and objective approach. I wonder which standard illuminant is the guide used by the makers of scanners. judging by experience the light sources used in scanners will vary according to quality (and cost) although they typically use a fluorescent light. The deviations have also been plotted for generic colours across the different light sources (not relating to scanners) which is the essence of my post and of course vary with both the colour and the light source. Thus for example a blueish green observed under daylight and then under cool white light shows a much greater deviation in respect to the reference plane (1.32 to 0.44) than a yellow green (0.56 to 0.59) - but note that there is still deviation.